And look at the pigs rushing over it and trampling it. to keep for the ages to come the purity which was. Saunders Lewis was one of those anomalies: a defender of a culture of which he was an unrepresentative member. A convert to catholicism in a country where the cultural elite were overwhelmingly non-conformist protestants, he nevertheless came to the fore as a leader, though often taking his people where they were reluctant to follow. Born the son of a Calvinistic-methodist minister in Liverpool he became, in many ways, the conscience of Welsh-speaking Wales as well as its prophet in the wilderness. In 1936, along with two other members of the Welsh Nationalist Party (subsequently Plaid Cymru) which he had founded, he entered the grounds of an RAF Bombing School which had been controversially built on a site of Welsh cultural importance. The three of them set a shed alight then waited for police to arrive to arrest them. A jury in Caernarfon failed to agree a verdict, and while awaiting a re-trial in London he wrote the play Buchedd Garmon. By the time of it’s first broadcast on the radio he was in prison. 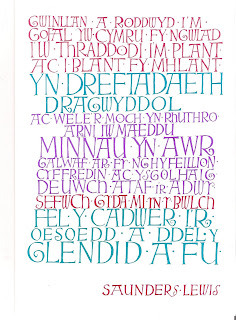 The appearance of this passage as a visually present text of lettering, its use by organisations like Cymdeithas yr Iaith (The Welsh Language Society) as a rallying call and its prevalence amongst those who may never have seen or read the play attest its importance as a cultural artifact. As is the lettering. 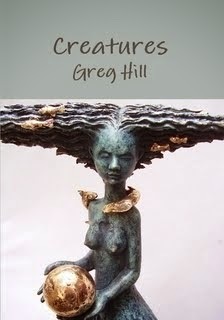 This visual art form is particularly apt in Wales where poetry is so highly valued. The piece above by Tegwen Jones is clearly influenced by the work of David Jones whose lettering (see example at the head of this blog) is more widely known outside Wales. At a local level I have on my wall at home part of a poem by a local poet. It is from an awdl for which he won the Chair at the National Eisteddfod for a poem in the strict metres. In honour of this achievement he was presented with an extract from the poem in lettering at a ceremony in the village hall and those present were able to order a print of the original which evocatively describes a cold winter day in the local woods. The function of such lettering in visually representing language goes some way towards making words more concretely present. It is an art form which is not given wide prominence, but one for which I have a great affection.